The closing stage of the Sunday in Hell spring tour ended somewhere on a Great Western train heading west from Reading. It was an exhilarating and at times zombifyingly tiring few days doing something I hadn’t done before, a series of book signings and Q&A sessions back to back, four in the space of five days across the south of the UK: London, Poole, Bristol, and London again. 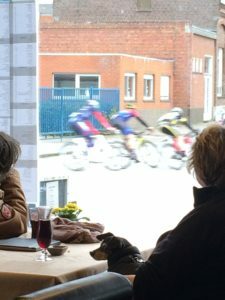 In distance and arduousness, it was more the Four Days of Dunkirk than the Giro. But it was fun. 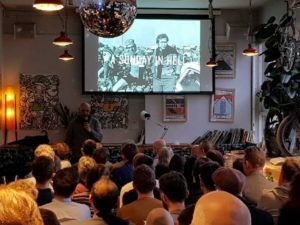 When I got close to the end of writing Sunday in Hell, it seemed the obvious thing to do was to combine screenings of the film with Question and Answer sessions about the book and the film, and a chance for people to buy the book. I don’t know if it is something that’s been done before with other books about films, but it seemed like a happy marriage: a film that people love and don’t get to see very often, and a book that I want to sell copies of. From this week, it seems clear that people do want to watch the film still, which I shouldn’t be surprised at, given that I’ve suggested it’s the greatest cycling documentary ever made, an enduring classic about a Classic, and so on. But it’s still surprising to see those venues sold out. And it seems that people want to watch the film and then buy the book to read more about the film which is also welcome, given that it is on that proposition that I’ve staked a year of my life in writing and getting nerdy about sections of cobbles, long-lens takes and state funding in Danish cinema in the early 1970s. So there was much to like: I got to the new look Herne Hill, which I have wanted to see since it reopened, partly because of its evocative history, also with my track league organiser hat on, as well as my track rider casquette. I visited Prendas Ciclismo in Poole, who were one of the first advertisers when Jeremy Whittle and I founded procycling in 1999, and who were supplying me with arm-warmers and stuff when I rode the FBD Ras back in 1997. Most appositely of all, I went back to the Watershed arts centre in Bristol, where the idea of “writing a book about a film about a race” was born when I went to a screening of Sunday there in 2010, did compere duties for a Q&A with Jorgen Leth, and realised there might be a bit more to this film than initially thought. Most commonly asked question: why did you write a book about a film? Blind sider: what is your favourite bike? The one I couldn’t answer; do you know anyone who doesn’t like a Sunday in Hell? With thanks to Look Mum No Hands in Old St, Prendas Ciclismo and Rockets and Rascals in Poole, Watershed in Bristol, and the Friends of Herne Hill for their help in setting the spring tour up. Next up: Ilkley on April 29, Ross on Wye on May 16 via Rossiter books. Ilkley is sold out I’m afraid, three weeks ahead of showing. Other dates pending… Any suggestions welcome at this address… Look forward to seeing you there. Back to the blogs now that the autumn evenings are drawing in, the Tour of Lombardy is safely behind us and Putte Kapellen has closed the Belgian racing season… The first of the winter is about my next book: a biography of Beryl Burton to be published in September 2019, entitled The Greatest: the Times and Life of Beryl Burton (I’m sure you can see what I’m doing there). Work is well under way, and it’s nice to have the bit firmly between the teeth. There are so many good reasons to write a Beryl Burton book, and so many good reasons to write it now. It’s a source of massive frustration to me that I never got to interview her when I was working at Cycling Weekly, not because I didn’t want to meet her, but simply because I was directed towards the European professional racing scene due to my talking French and Italian, while senior writers such as the late Dennis Donovan gravitated towards Beryl. And like everyone else, I just assumed that Beryl Burton would be there for a lot longer than it sadly turned out. She was a fixture in the British cycling world, one of those unique figures who was simultaneously a god like person who was way above the average in what she had achieved, yet who was accessible because she did the same races that so many did. All British cyclists of a certain age have either been caught by Beryl in a time trial, or have a friend who has. So I only ever got to write her obituary for the Guardian, and hopefully I did a reasonable job of that. (The obit doesn’t appear to be on line now like many stories from pre-2000, but it was printed in the anthology of my writing for the paper, Racing Hard. And yes, that’s a gratuitous plug). 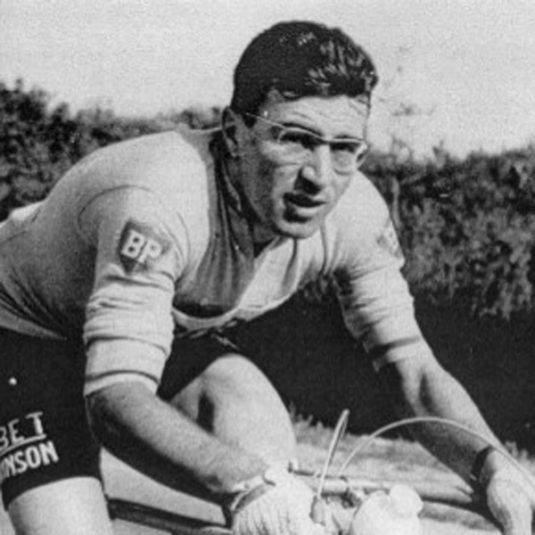 Having written about Eddy Merckx, Tom Simpson, and Fausto Coppi, as I moved on to Bernard Hinault, it became clear that I would end up writing a series of biographies of the greatest cyclists the sport has known: Beryl Burton was obviously going to be on the short list of potential candidates, given her longevity and her prolific medal winning record. I knew I was interested in Beryl Burton’s story but it was hard to figure out how many other people might be, until I went to see Maxine Peake’s play about her, when it came on tour to a small town in the Welsh borders. The place was packed; clearly her story still resonated, in much the same way that I became aware of the enduring interest in the Simpson legend when I went to watch Ray Pascoe’s film about him. The Beryl Burton story taps into so many things: the theme of greatness and its complexities that I’ve explored in most of my books one way or another. Cycling in Britain which is something that I love in all its various meanderings and in the way it melds into the social history of our country. I’ve always been aware of the barriers women have faced in this sport, which was what drew me to help Lizzie Armitstead (now Deignan) when she wanted a ghost writer for her autobiography. There’s Yorkshire, where I learned to ride a bike, and where I picked up an East Riding accent which was knocked out of me at primary school. And then there’s time trialling, something I have done a lot of, like so many cyclists, but have always been completely rubbish at. It’s taken a while and a few circumlocutions, but here I am, doing what I love best: getting to know a character from cycling history to, I hope, the nth degree. One big difference with this book is that it’s my first self-publishing project, albeit with some support in logistical terms which will make things a lot simpler once the writing is done, plus a link to the Dave Rayner fund which fits so well with the Yorkshire theme. The “Rayner” will receive a pound per copy sold. My last book, Sunday in Hell, made me realise that there is not just one template for writing, publishing and marketing a book. You don’t have to stick with the conventional model. Sunday was a radically different but hugely rewarding thing to do and given the demand for screenings of the film, it seems to have struck a chord with fans who have seen the film and/or love the race; Beryl Burton, the Times and Life, is an intriguing and slightly daunting experiment for me but it should be a lot of fun seeing what comes out at the end. I will be posting updates on a Facebook page – The Greatest: the Times and Life of Beryl Burton – where you can register an interest for a reminder when we begin taking advance orders some time next spring. To do so, visit the Facebook page, find the “event” tag for publication, and register as “going”. I had a fun Bank Holiday weekend at the Giro, but not the Giro the whole cycling world was talking about. 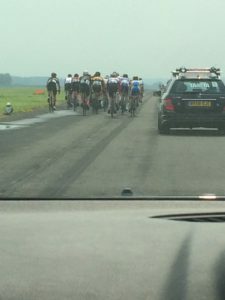 I wasn’t in Rome watching Chris Froome’s triumph, instead I was not far from home in Shropshire driving a neutral service vehicle on the Giro del Mon https://www.girodelmon.co.uk, a three-day, five-stage race set up this year by Shrewsbury’s Chris Pook, of local club Rhino Velo Racing. As a result over the three days I got to see more bike racing up close than in nearly 30 years covering the Tour de France. First up, can I just say that anyone who thinks the job that those yellow Mavic cars do on the Tour de France and other races is simple, then think again. Me and my three helpers, parents of other riders in the Halesowen Cycling Club Academy, were stretched to the limit at times. What we had in common with Mavic is that it’s a stressful deal, trying to change wheels rapidly when a rider is in a panic. 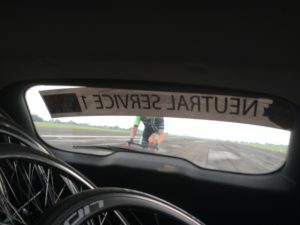 For us, however, in many cases the riders hadn’t to do a wheel change in anger before, plus in a race on open British roads you are always conscious that another vehicle could plough into the back of you as they probably won’t be expecting a car to be stopped dead in the road just around the next corner. It was also pretty salutary to see the hard work that went in to keep the show on the road. The joy of a stage race for riders and media is that anything can happen. The nightmare for the organising team is that anything can happen. In this case it was a finish that had to be changed, a wealth of winter potholes (irony of ironies, the race made friends among locals who realised that if the council wouldn’t fill them, the race organisers would), and thunderstorms which caused landslides, felled trees, piled up mud in places, and ran gravel six inches across the road. All that had to be managed on the hoof, before the show even took to the road. Why did I get involved? Increasingly in recent years, my philosophy has been that it is better to try and do things rather than whinge on the sidelines. 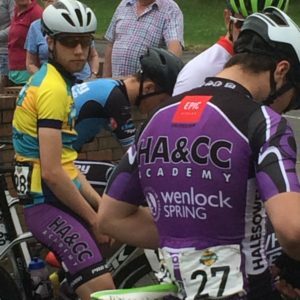 There was a massive shortage of races in our local area a couple of years ago, making it hard for us to help young riders to develop, so we formed a work group to try to support organisers. Chris was part of that group, so you help out. Simples. Plus, it gave me a chance to keep an eye on some of the riders in the club team that I look after, one of whom, Charlie Walker, ended up in yellow for a day (below). There is a bigger picture here. Compared to Ireland, where three-day stage races have proliferated in the shadow of the Ras, stage races in England are hard to find at the echelon between two-days and the Tour of Britain, the Tour of Sussex in July being an honourable exception. 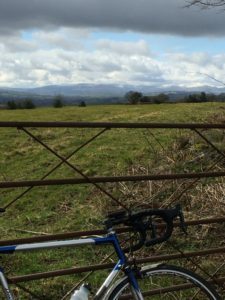 As a young rider I remember events like the Ras de Cymru – last run in 2016 – and the Launa Windows 3-Day; good strong local events with an established identity that provided a stepping stone between one-day races and the higher level. And these are precisely the events that help riders develop. 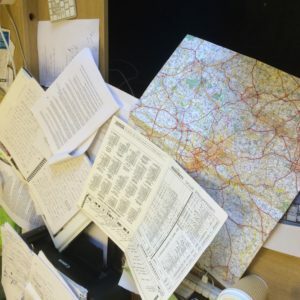 It’s not simple to run stage races on British roads – and it is expensive – but the advent of accredited marshals may have changed the game, even if the costs for riders are higher, simply because as well as rider safety, events have a far more professional face to show fellow road users and the police. In an ideal world, every BC region should have something like this event, and if what Chris and his team managed over the weekend helps inspire other potential organisers by making them realise what can be done, all to the good. Advance warning. I’ve been trying for a while to figure out how to do these blogs and have finally decided the only approach is the well known sportswear company one: Just Do It. But I think a proviso is necessary. These pieces are not going to be controversial, opinionated, “calling out” anyone for this and that. I don’t have a massive legal team to back me up, andI have a very good forum in the Guardian when they ask me to put across my views on Jiffy Bags and such. The desk as the creative frenzy reached its height. I’m not going to upload photos of the crash’s after effects on public health grounds. Nope, these are going to be about the cycling that takes up most of my life, about the bits of bike related stuff that I come across when I get out of the Shire and visit the real world for work reasons, and occasionally about the non-cycling thingies that creep in when I turn my back. So the last week has been dominated by two things: the arrival of the new book, and the biggest crash I’ve had in years, that has left me nursing a seriously ropy shoulder. 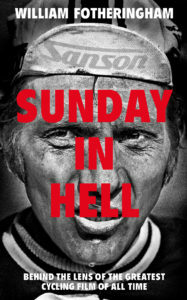 Getting your mitts on a new book is a lovely feeling, especially when, as is the case with Sunday in Hell, it’s the first one with only my name on the front cover since the Bernard Hinault biography back in 2015. There have been ghost-written books since then, both of which I’ve been very proud of, but those are not the same. So it’s a special moment when you rip open the Jiffy Bag (insert your own joke here), and there in front of you is the finished product of several years work. In this case, I had the original idea back in 2011, I started talking about it with the publisher in 2012, and did the first interview for it in 2015. After that, Bradley Wiggins and Lizzie Armitstead asked me to help with books for them, and those kind of proposals are hard to turn down, hence the delay. So it’s been a long road with this one, and finally you get your reward. It’s rewarding to look at the details, the things the designers put in that sound great in theory and look fine at the proof stage, but which you can only be certain about when the finished article turns up. There are a lot of screen grabs from the film in the book, and they are perfect; there’s a little motorcycle camera logo on many of the pages (to find out exactly what it does you will have to buy the book) and so on. There are some nice pics in the plate section, some taken by me which is a surprising development but they’ve come up sharp. All good. Most of all, I like to look at a new book and contemplate: a lot of work went into that. But what I can never do is actually read the book. I’ve seen that text so many times that frankly I’m fed up with it. It takes about four or five years before I want to look again at one of my books. That nice moment made up for the crash in the Abergavenny handicap, which was horrible. These days, I am massively paranoid about how I race, because now that I am in my 50s there is every chance that I won’t manage to race again after a really heavy one with broken bones. So I channel Steve Cummings, staying last wheel or so. Or I sit in the left-hand gutter, usually with half an eye on the roadside eying out where I can take evasive action. Risks are taken only when strictly necessary. On this occasion I was in the middle of the bunch, close to the front but not at the front, which is a position I try to avoid. It was a classic British race crash, where someone was on the wrong side of the white line, moved across to his left to stay safe, and someone else got caught in the wave and touched a wheel. Two riders ahead of you, you can’t avoid it. At 30mph, it’s going to hurt, although luckily I fell onto the first faller; the big bruise on my hip is probably his pedal. There were others worse off than me so I’m not complaining. First of a series of blogs on the new-look website. The risks you run as a cyclist if you don’t take winter seriously were brought home this week when a cyclist of my acquaintance ventured out on what looked like a decent enough day only to be caught in a big sleet shower 30 miles from base. The bike rider in question had a cape with him but otherwise was in thin stuff. He ended up shivering under a blanket in a cafe, borderline hypothermic; if he had one thing to be thankful for, it was that he didn’t get a mechanical and end up by the roadside at what could have been a very nasty moment. Over the years I’ve had enough “episodes” to fill up a Monty Python type “we had it tough” sketch – frozen bottles, frozen everything I guess – but the fact is I actually relish the arrival of winter, having worked out some simple ground rules from experience. Some of these are pretty obvious, maybe all of them if you have been cycling for a while. Some you won’t agree with, but that’s fine. I would just add the proviso that these are my own opinions; no one has given me freebies to make me write nice things about their products (interestingly, companies are always happy to give journalists summer kit, never winter stuff). It is one of the most evocative of opening sentences: “In my case I came upon the Tour de France by way of Whitley Bay and Morecambe.” To paraphrase the late Geoff Nicholson’s beginning to this book, in my personal case I came upon the Tour de France by way of The Great Bike Race. There are books that change your life and shape your life. This is one of those. The consensus is that this is the closest Tour de France ever, with one week left to the finish, but whether close equals boring stalemate or suspense-filled tension is a matter of some debate. Friday’s stage through theVosgesmountains toColmarsummed it up: there were three nasty climbs and it teemed with rain all day. Just right for someone to start sniping at Lance Armstrong and Alberto Contador, you might have thought. And there was gunsmoke in the air, but unfortunately it was from someone on the roadside who thought it was clever to pop an airgun at the peloton.